Be the first to share your favorite memory, photo or story of Kordelia . This memorial page is dedicated for family, friends and future generations to celebrate the life of their loved one. Kordelia Rose Shirley left this world on April 8th, 2019 at the age of 2 years and 6 months. During her time with us, Kordelia was a pure joy, an inspiration, and a miracle. She is survived by her mother, AnnMarie Shirley; father, Kraig Kallmeyer; brother, Karson; sister, Kamara; grandmother, Elizabeth Shirley; grandmother, Ellen Kallmeyer; great-grandmother, Elizabeth Leary; and many aunts, uncles, cousins, friends and admirers. Kordelia was born on October 7th, 2016 in the NICU at Vassar Brothers Hospital in Poughkeepsie, NY. Coming into the world with a surprise diagnosis of Trisomy 18, she returned regularly to both Vassar and Maria Fareri Children’s Hospital. We shared her life with many Nurses and Early Intervention Specialists who we often referred to as co-parents. Despite the challenges and the odds, Kordelia graced our lives for over two years with her beauty, strength and love. She will live on always in the hearts of her family and friends as the epitome of faith, hope and courage. Calling hours will be at Sweets Funeral Home, 4365 Albany Post Road in Hyde Park, NY on Saturday, April 13th from 10AM-1PM. There will be a spiritual fire ceremony and prayer to honor the life of Kordelia at InnerLight Movement Studio, 1 East Dorsey Lane in Poughkeepsie on Saturday, April 13th at 6:30 PM. 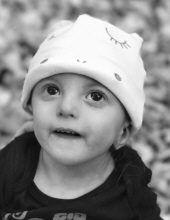 In memory of Kordelia, please consider donating to Support Organization For Trisomy (SOFT), 2982 South Union Street, Rochester, NY 14624 or at trisomy.org. To learn more about the story of Kordelia Rose, please visit her YouTube channel KordeliaRose or website at T18KordeliaRose.com. To plant a tree in memory of Kordelia Rose Shirley, please visit our Tribute Store. Spiritual fire ceremony and prayer to honor Kordelia's life. "Email Address" would like to share the life celebration of Kordelia Rose Shirley. Click on the "link" to go to share a favorite memory or leave a condolence message for the family.